Event Description: Bar$tarz present: DJ COBRA LIVE AT PURE! Andrew Bagg, otherwise known as DJ Cobra, is one of the premier open format deejays today. A solid fixture in the nightlife and party scene, he holds multiple residencies in Hollywood and spins at some of the most popular clubs throughout the country. With over 300 performances a year and monthly residences in multiple cities, Cobra is constantly jet setting worldwide, breaking barriers and appearing internationally more than any other open format DJ. Cobra has also toured, opened for or performed with over fifty gold & platinum recording artists including: P. Diddy, Prince, Ludacris, Nelly, John Legend and Lady Gaga, to name just a few. In the corporate and private event world Cobra continues to play some of the most notable and high profile events in the United States such as Paris Hilton’s 30th Bday party in Hollywood, The Wesinstein’s Golden Globe Party, Ferrari’s 458 Launch party with John Mayer, MTV Blackberry VMA Party with NeYo, The South Beach Food and Wine Festival, Miley Cyrus’s 18th birthday party, AT&T and Fox American Idol official events, Star Magazine’s Young Hollywood Event, Hollywood Life’s Young Hollywood Awards, NASCAR Event with Danica Patrick, Southpark’s 200th Anniversary Event MTV’s Real World Cast Party in Las Vegas, Madonna’s Material Girl launch party with Kelly Osbourne, Jamie Foxx’s NBA All Star Weekend party, plus many more. In addition to his busy club schedule, Cobra continues to push boundaries expanding his reach into other areas of entertainment. DJ Cobra toured with culinary great and host of NBC’s “Minute to Win it,” Guy Fieri, in 2010 and is returning to the road with him in 2011, for a second straight tour. 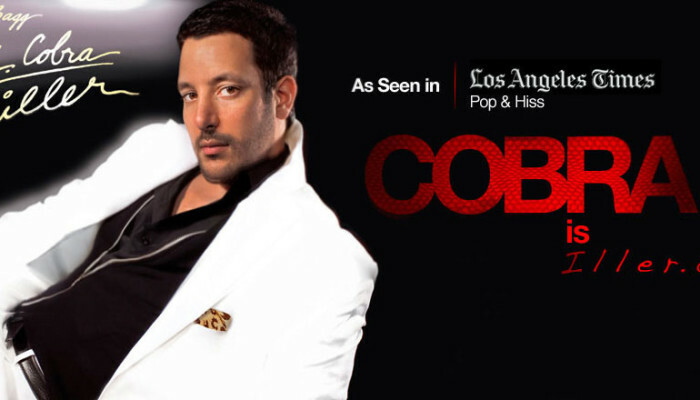 Cobra was the featured deejay on Good Morning America’s Oscar Special seen by over 30 million households. He also has made numerous television appearances on shows including Jimmy Kimmel Live, Late Night with Carson Daly and Comics Unleashed. $10 Cover ALL NIGHT LONG!